You can let the colors, materials, theme, or any part of this photo inspire you. 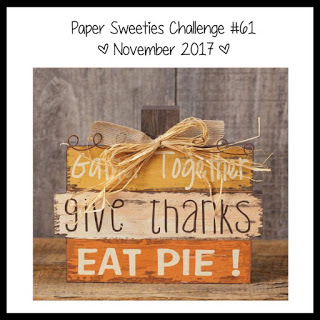 It's an Anything Goes Challenge, and all my friends at Paper Sweeties look forward to seeing what you will create to share with us. I decided to make a fun little Autumn card for the challenge. I wanted to have Jake come out and play for this month's challenge. Doesn't he look handsome in his fun Autumn outfit? I stamped Jake and then cut him out using the coordinating Jake Sweet Cut. 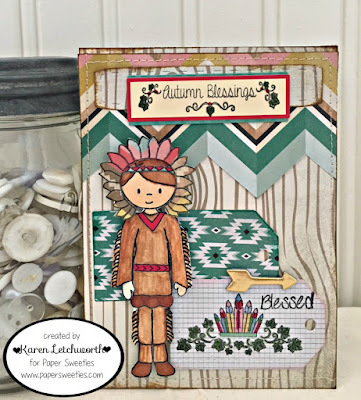 His awesome outfit (including the clothes, headband and head dress) are all from the Autumn Blessings set; as well as the sentiments I used (Autumn Blessings and Blessed). The Autumn Blessings sentiment was stamped onto a sticker, but it is positioned on top of a banner from the Sweet Borders Sweet Cuts. I also cut two small tags from the Stitched Tags #1 Sweet Cuts, and on the one I stamped another image (feathers) from the adorable Autumn Blessings set. There are so many versatile and fun sets at Paper Sweeties to help you create something amazing. Be sure to stop by and check it out, and then come play along. Here's a list of all my teammates at Paper Sweeties who have prepared something to inspire you for this awesome challenge. Karen Letchworth - That's Me! 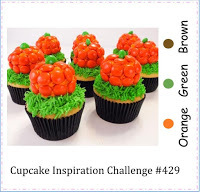 Cupcake Inspirations Challenge #429 - I love this color combination, and the Autumn theme, so I thought this card would also be a good fit. I guess the whole Autumn spirit spoke to me. Not to mention, I also LOVE Newton's Nook. Thanks for another great challenge! Crafty Hazelnut's Patterned Paper Challenge - November Challenge - I used several patterned papers from a line called Journey by Create Paper. Indian Jake is just cute as can be!! Jake is cute as can be in his Indian outfit! Lovely patterned papers and great touch with the stitching! Oh how cute! I love your card featuring "Jake" in his autumn outfit! Thanks so much for linking this adorable card up to Cropstop -- we're one closer to our goal of 100 links! This is so cute! Your little Jake is dressed so adorable! I love the papers and cute design! Stamping sweet! Like the Jake Character and the card layout - fabulous! That is so cute! 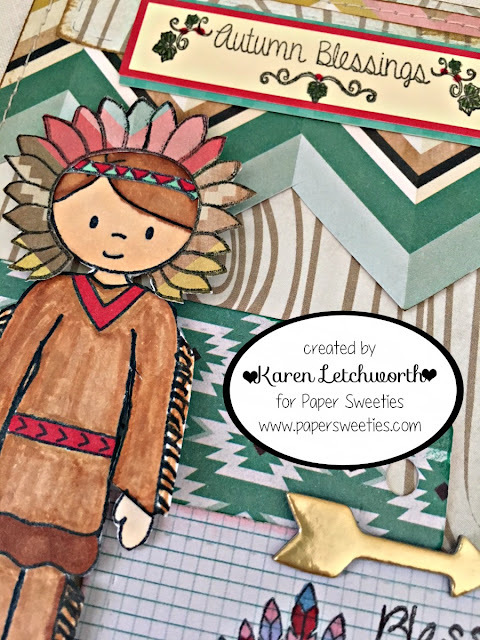 Thanks for your entry to CraftyHazelnut’s Patterned Paper challenge!